Unique signal halos let you know that you’ve got a good audio level for recording. Green is good and red means that your audio is too loud, and that you should turn down the level control. Since 1985, Focusrite has been a leading manufacturer in the professional audio field. Focusrite mic pres are the choice of leading artists, recording studios and engineers around the world. 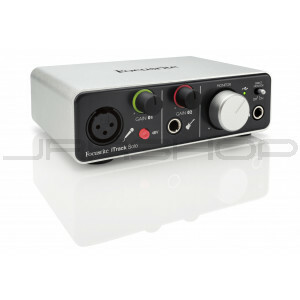 Now get the quality of Focusrite on your iPad or computer. Use the iTrack Solo’s premium quality audio outputs to take your sound to Hi-Fi, speaker systems or headphones to hear the difference Focusrite can make. At Focusrite, that's all that matters – Sound is Everything. A supplied cable connects iTrack Solo to the iPad, and it is powered by the included USB cable that delivers the power necessary to run the iTrack’s high-specification components. If you are using iTrack Solo with a Mac or PC you don't need to connect it to the mains, your computer will supply enough power via the USB cable. The cable supplied in the box with your iTrack Solo is designed to pass Apple's Made for iPad tests to ensure that any official iPad accessory can meet their standards for noise interference resilience, specifically the TDMA noise that can be induced when an iPad receives a telephone call over a 2G network. Need a longer device link cable? Click to see more on the device link extension cable. iTrack Solo works with iPad, iPad2 and iPad (3rd generation) and will work with all iPad applications that use the Apple Core Audio driver. The iTrack Solo will also work with PC and Mac computers. The cable supplied in the box with your iTrack Solo is designed to pass Apple's Made for iPad tests. Should you wish to use an extension cable in order to obtain more reach or flexibility for the positioning of your iPad/iPhone, visit this page. The preamp design on the iTrack Solo is the same design as used in the Scarlett and Saffire audio interface ranges, used and trusted by top musicians and artists around the world. With a dynamic range of over 105dB, your music will sound amazing going out of the iTrack Solo’s professional digital to analogue conversion. The tough aluminium unibody chassis ensures that your iTrack Solo can withstand life on the road, and looks great next to your iPad. The gain halos which surround the gain knob for each input provides an easy way to know that the signal you’re recording is the right level. It will show green when the signal is at a good level (above -24dBFS). If it turns to red, you know that the signal is too loud and is therefore clipping – if this happens, simply reduce the gain until the halo returns to green. Flick the direct monitor switch on the front panel of your iTrack Solo and you will hear what you are recording through your speakers or headphones, without the signal having to go through your iPad or Mac / PC. This avoids the possibility of "latency" (a slight time delay) being introduced by your music app, which can be distracting while recording. Inside the box you’ll find a code which will unlock Ableton Live Lite 8, as well as Focusrite’s Scarlett plug-in suite. Compatible with all major DAWs (digital audio workstations) on Mac and PC, Scarlett plug-in suite provides EQ, Compression, Gate and Reverb – essential tools for polishing your mix. Ableton Live Lite 8 – professional music making software to use your iTrack Solo with a Mac or PC. Focusrite Scarlett plug-in suite – collection of software plug-ins bringing effects to your music software (like Ableton Live for example).